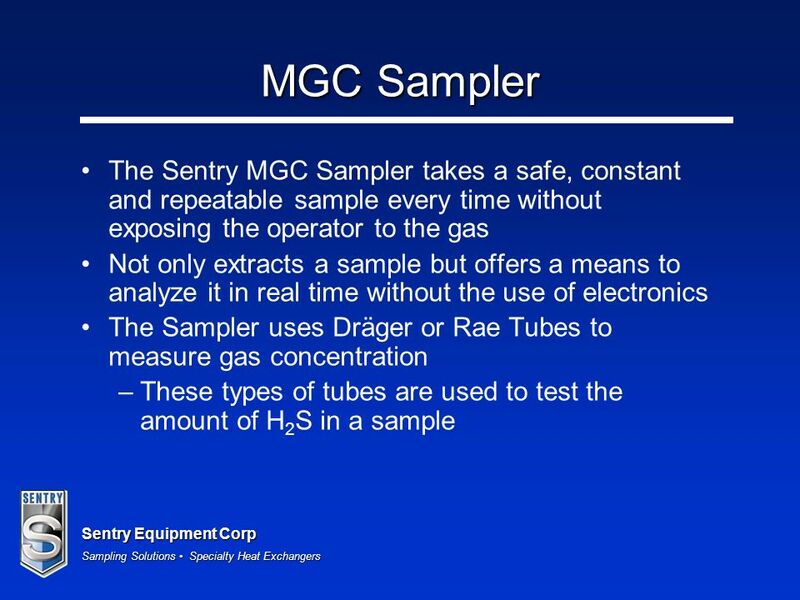 Sentry Equipment Corp Sampling Solutions Specialty Heat Exchangers Sentry Equipment Corp Gas and Liquid Sampling. 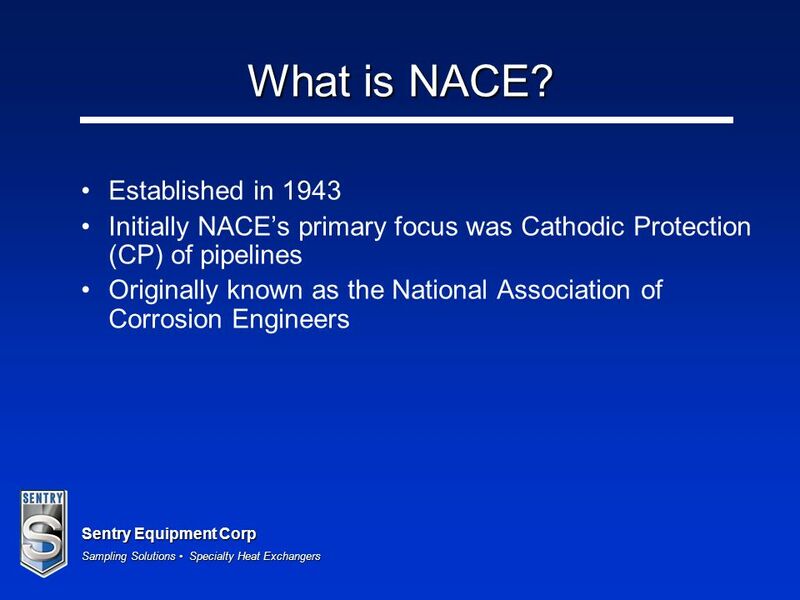 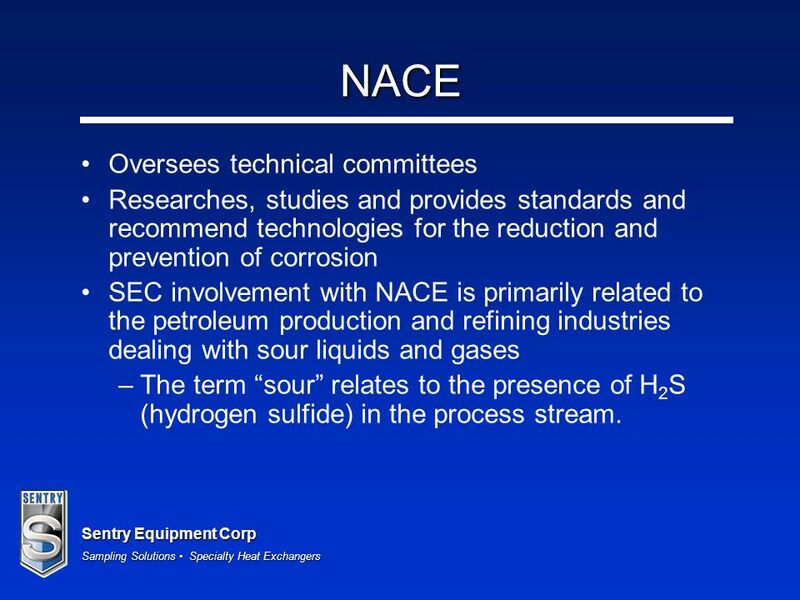 9 Sentry Equipment Corp Sampling Solutions Specialty Heat Exchangers NACE Oversees technical committees Researches, studies and provides standards and recommend technologies for the reduction and prevention of corrosion SEC involvement with NACE is primarily related to the petroleum production and refining industries dealing with sour liquids and gases –The term sour relates to the presence of H 2 S (hydrogen sulfide) in the process stream. 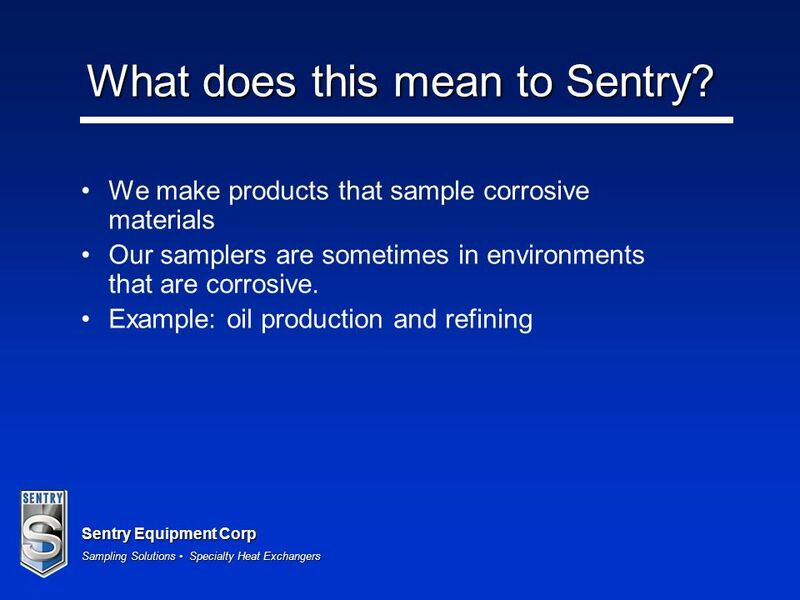 15 Sentry Equipment Corp Sampling Solutions Specialty Heat Exchangers Silcosteel ® and Sulfinert ® Sulfinert ® –A required treatment for metal components when analyzing for parts-per-billion levels of organo-sulfur compounds. 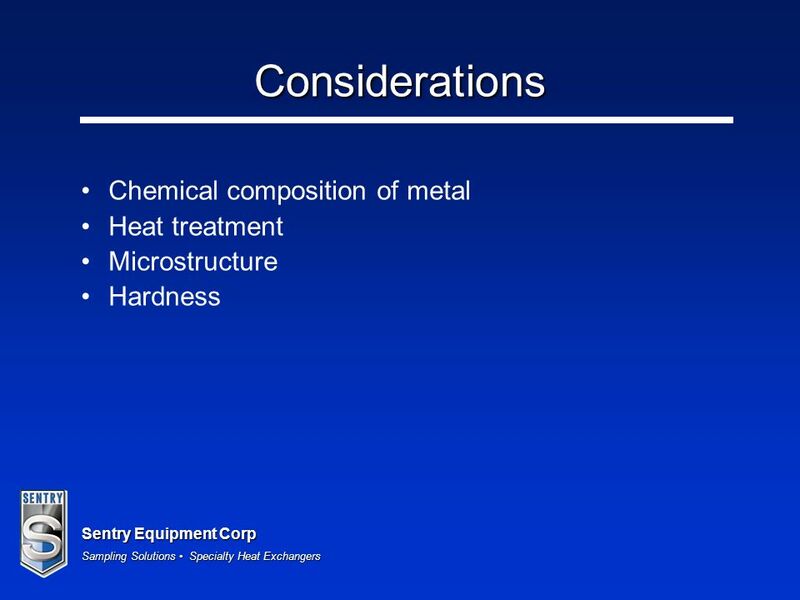 Siltek ® –The ultimate passivation for treated components, from glass to high nickel alloys of steel. 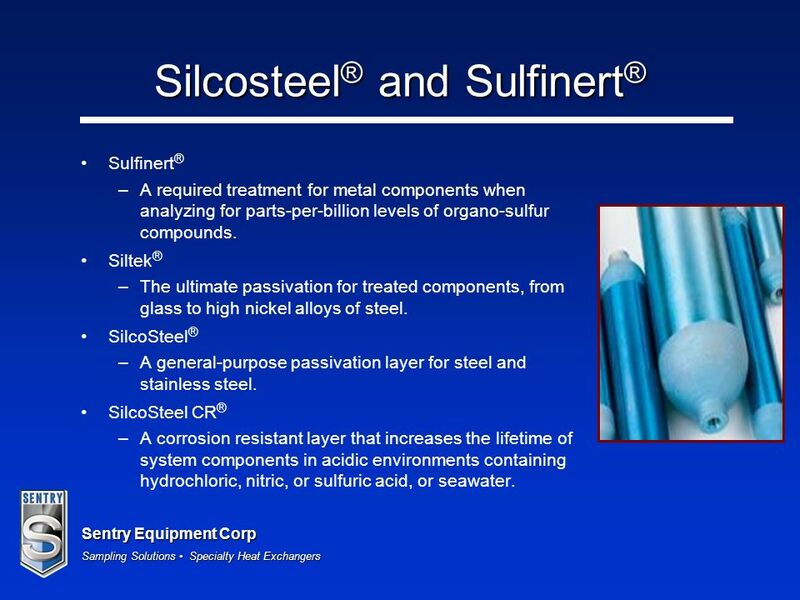 SilcoSteel ® –A general-purpose passivation layer for steel and stainless steel. 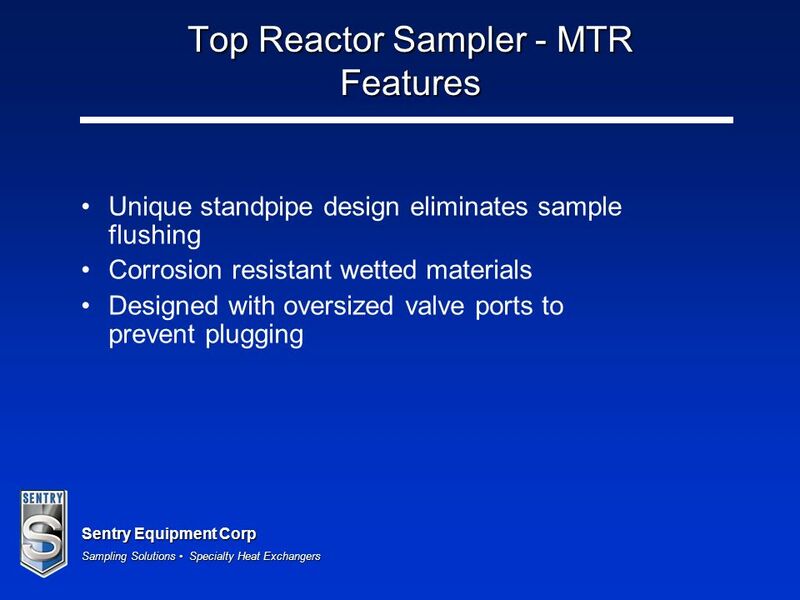 SilcoSteel CR ® –A corrosion resistant layer that increases the lifetime of system components in acidic environments containing hydrochloric, nitric, or sulfuric acid, or seawater. 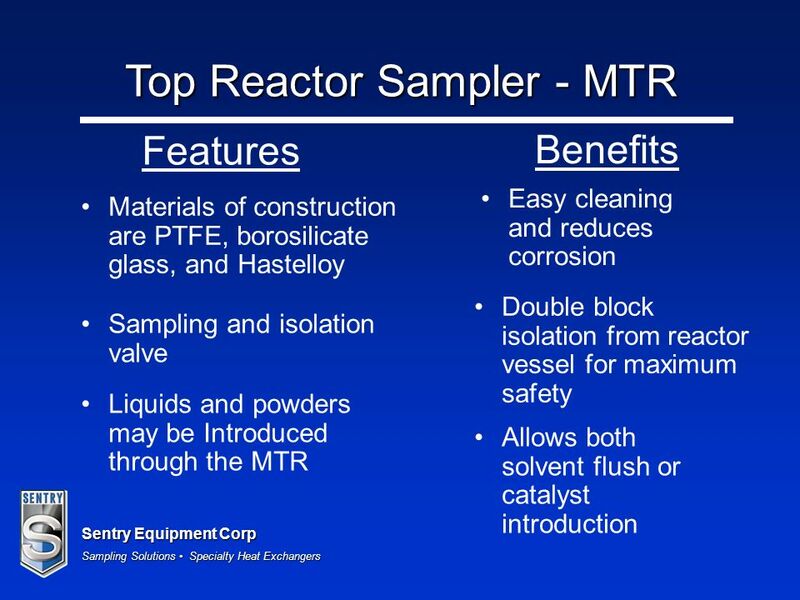 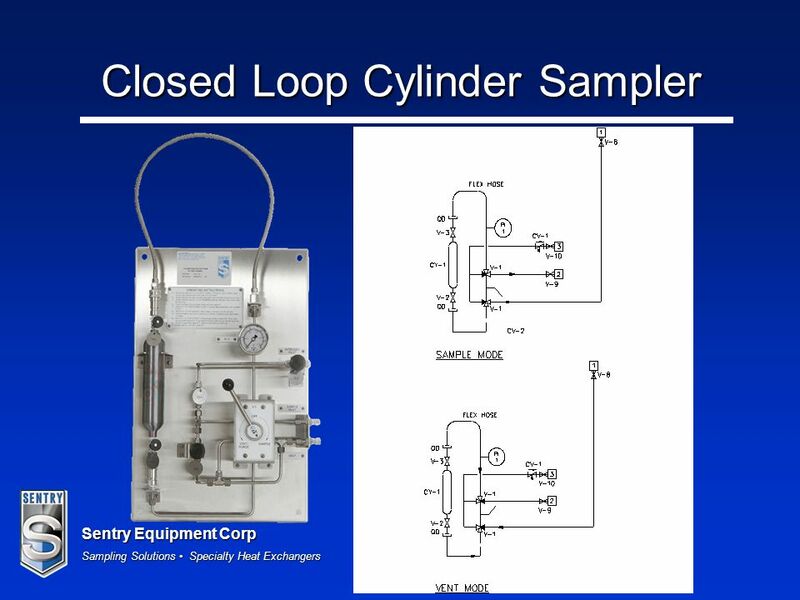 30 Sentry Equipment Corp Sampling Solutions Specialty Heat Exchangers Questions? 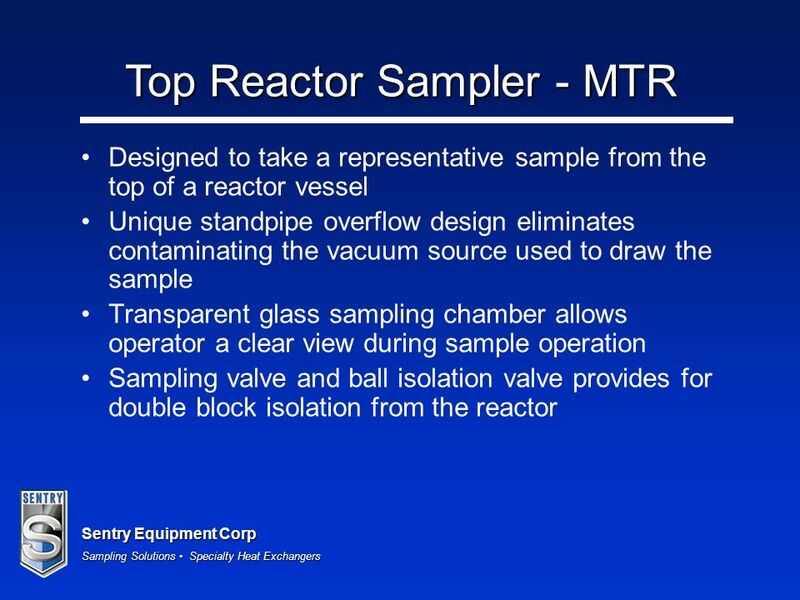 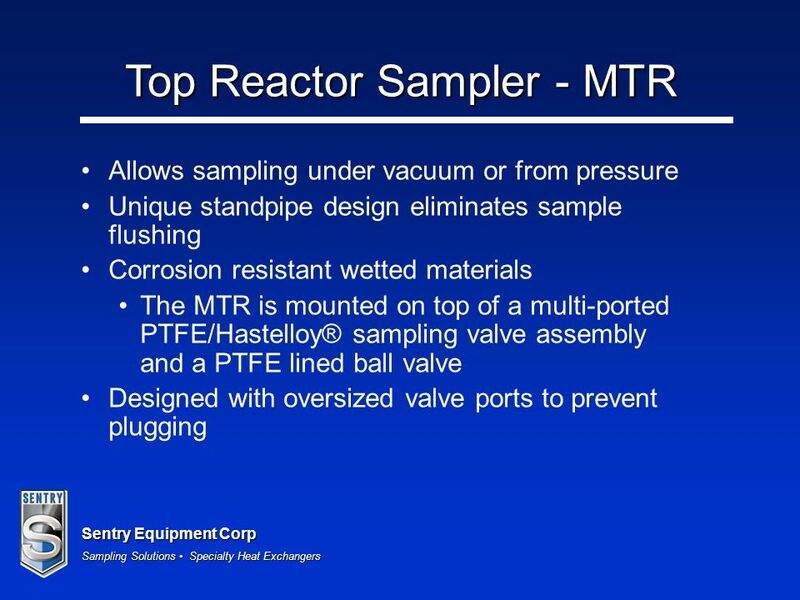 38 Sentry Equipment Corp Sampling Solutions Specialty Heat Exchangers Questions? 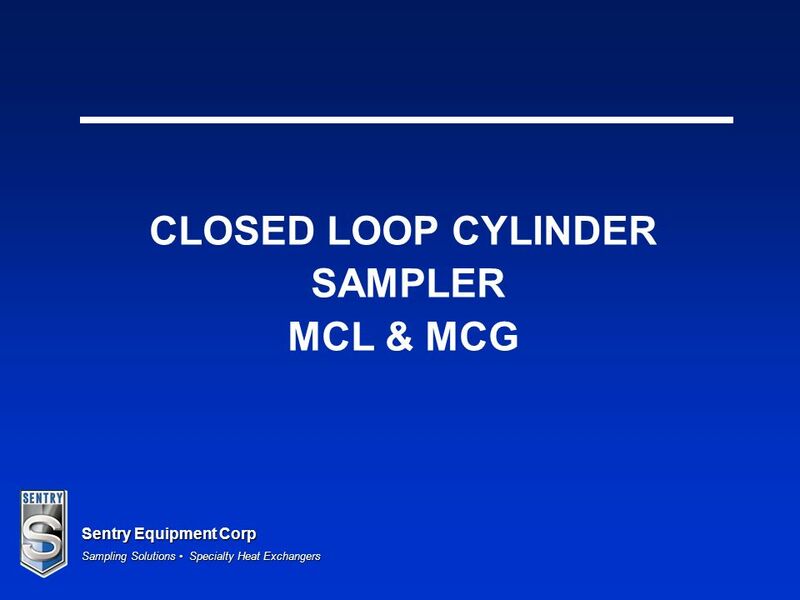 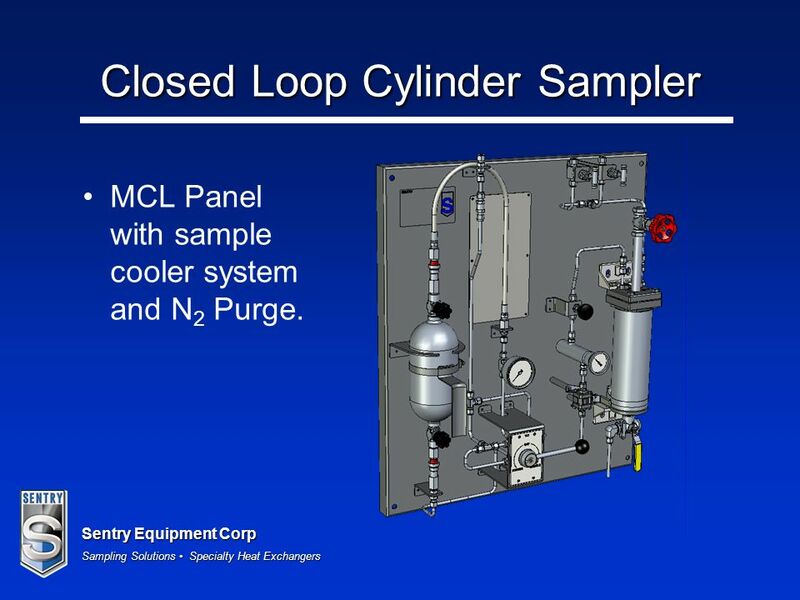 42 Sentry Equipment Corp Sampling Solutions Specialty Heat Exchangers Closed Loop Cylinder Sampler MCL Panel with sample cooler system and N 2 Purge. 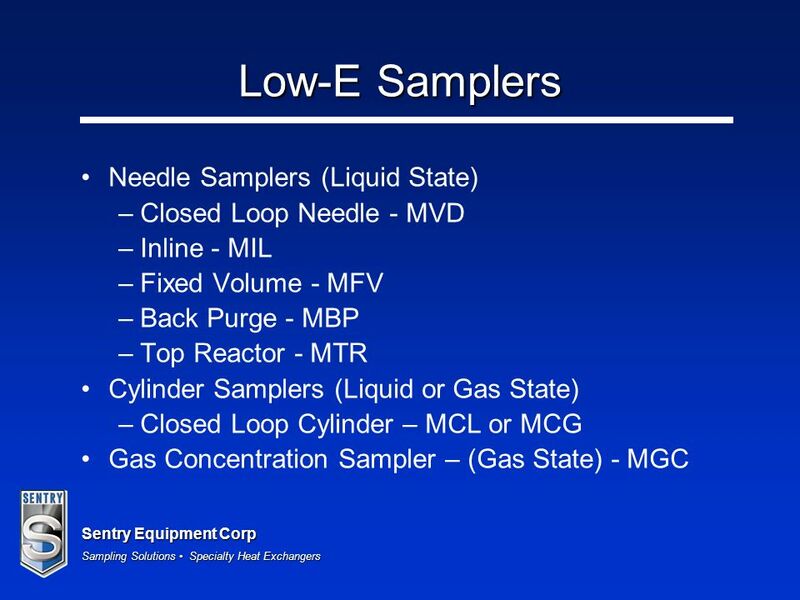 43 Sentry Equipment Corp Sampling Solutions Specialty Heat Exchangers Questions? 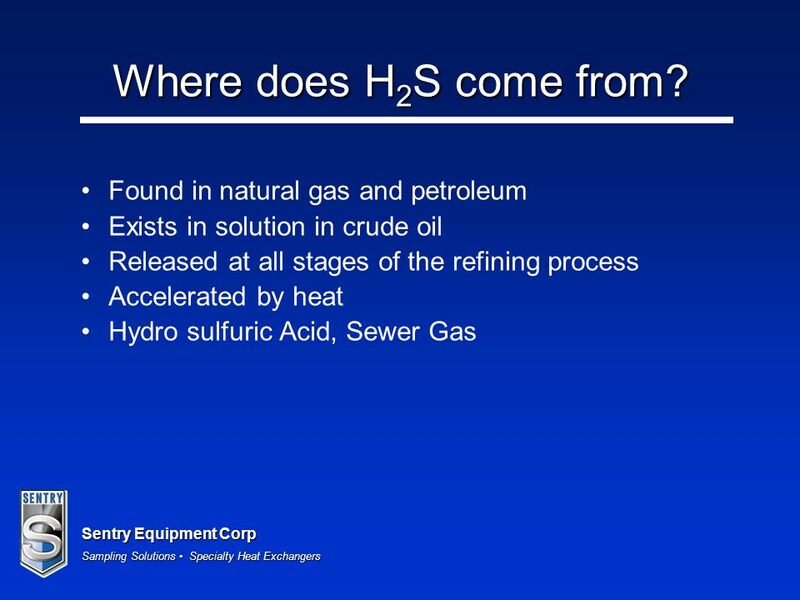 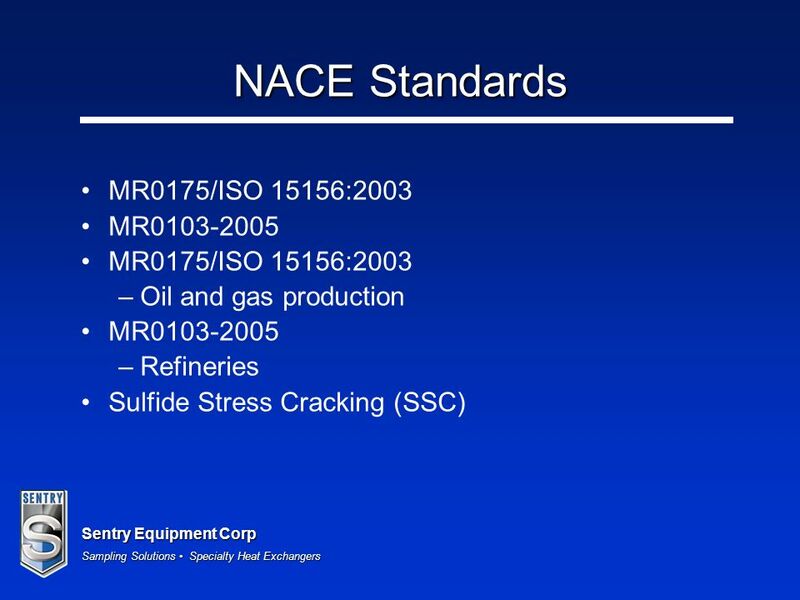 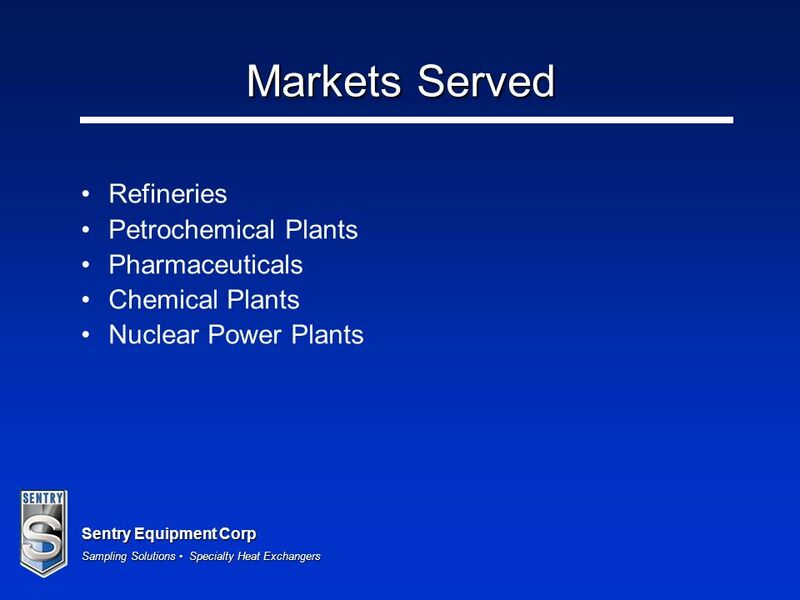 50 Sentry Equipment Corp Sampling Solutions Specialty Heat Exchangers What is H 2 S? 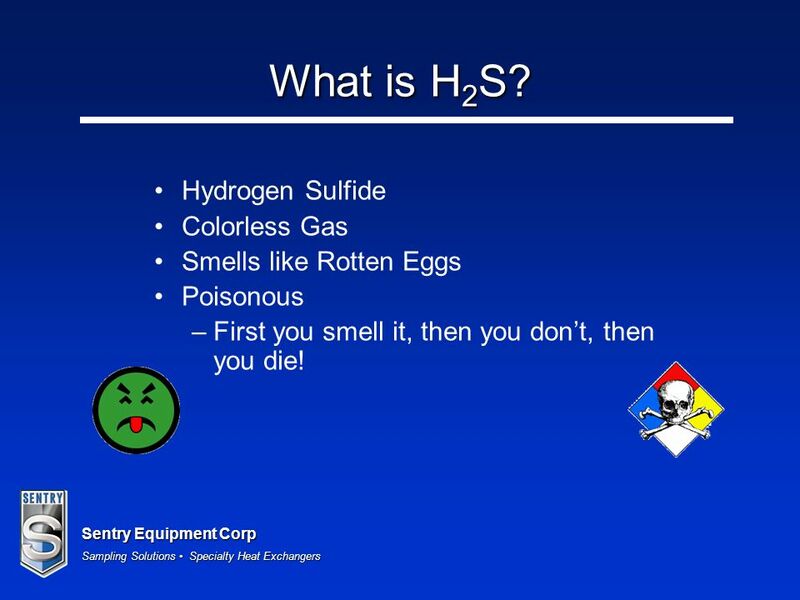 Hydrogen Sulfide Colorless Gas Smells like Rotten Eggs Poisonous –First you smell it, then you dont, then you die! 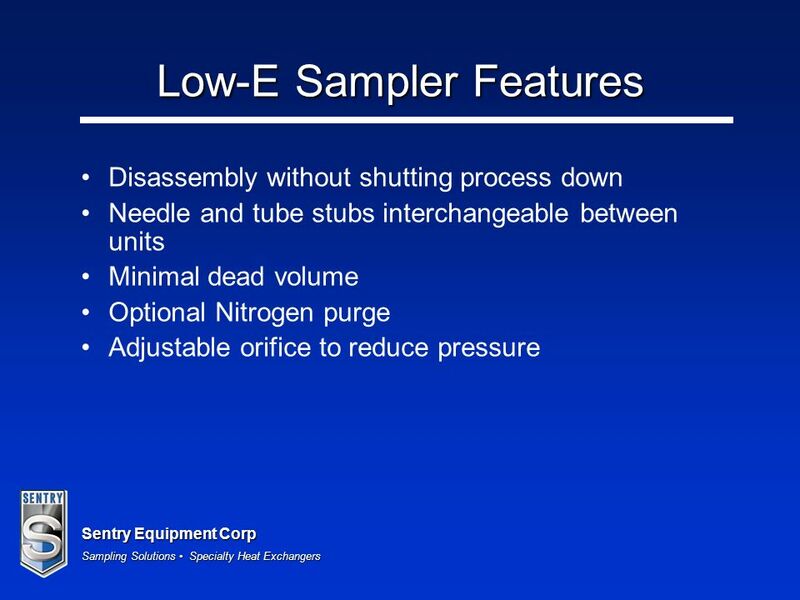 59 Sentry Equipment Corp Sampling Solutions Specialty Heat Exchangers Questions? 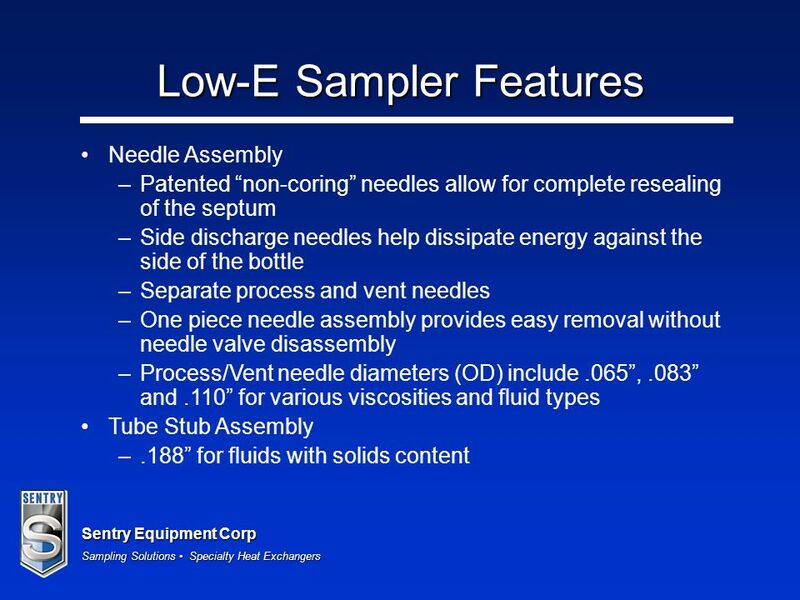 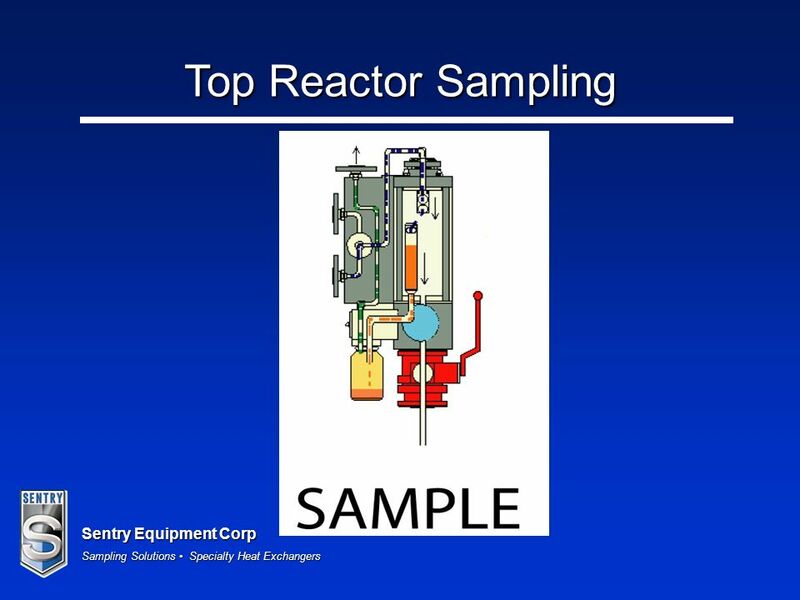 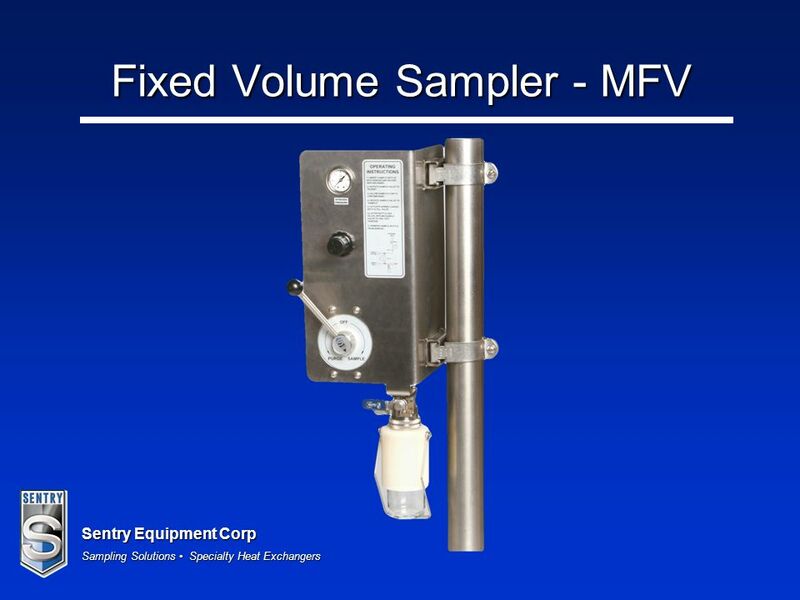 63 Sentry Equipment Corp Sampling Solutions Specialty Heat Exchangers Questions? 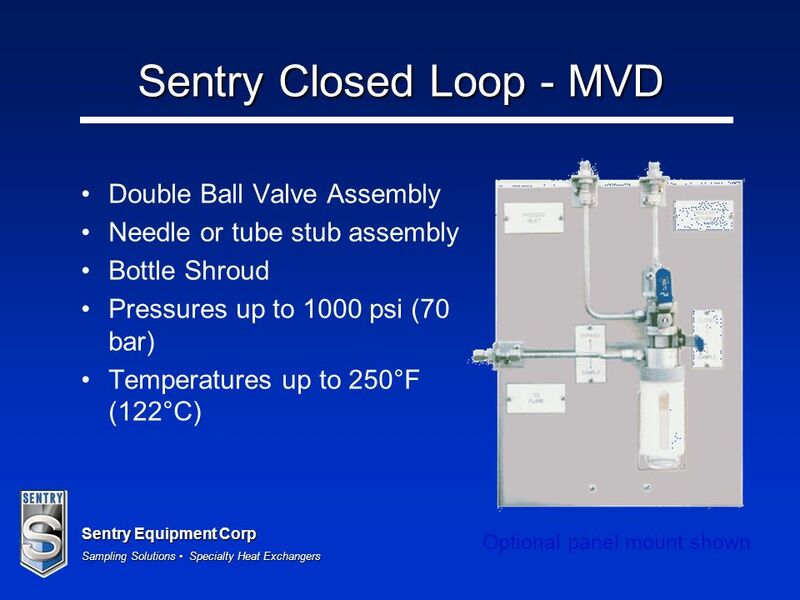 71 Sentry Equipment Corp Sampling Solutions Specialty Heat Exchangers Questions? 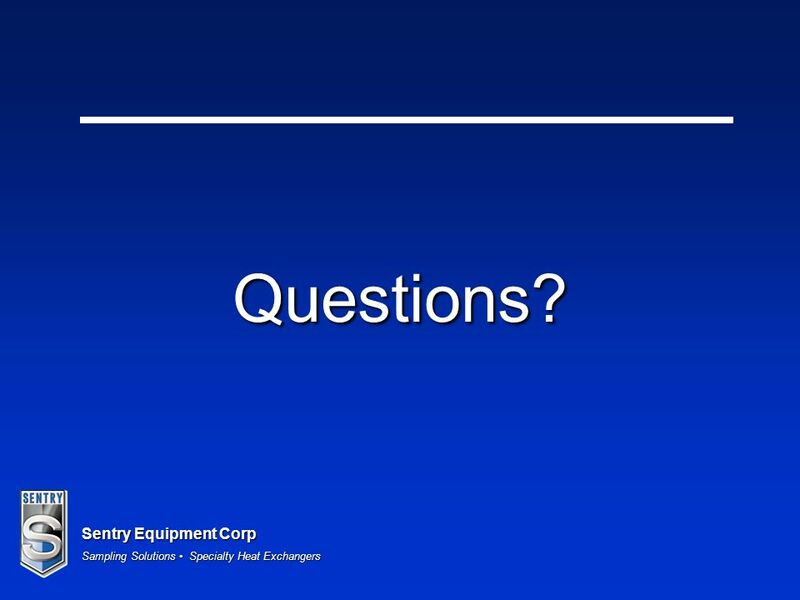 73 Sentry Equipment Corp Sampling Solutions Specialty Heat Exchangers Questions? 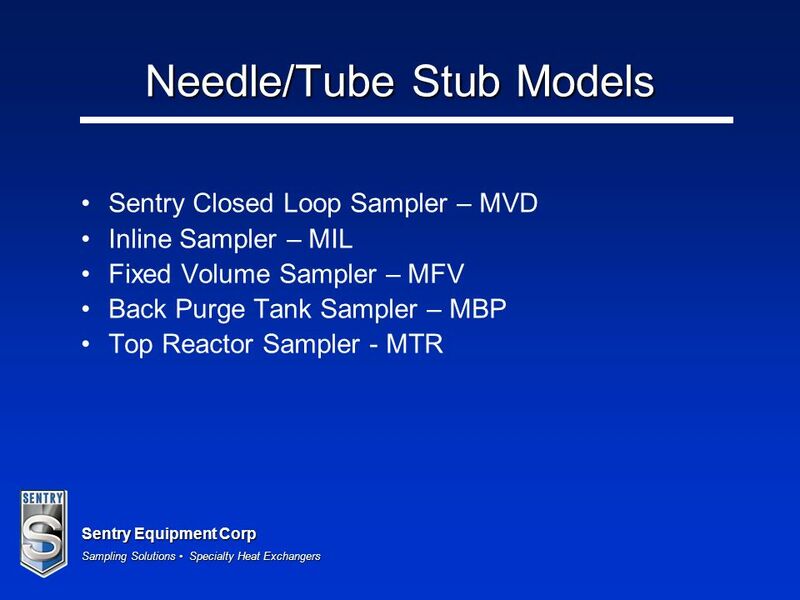 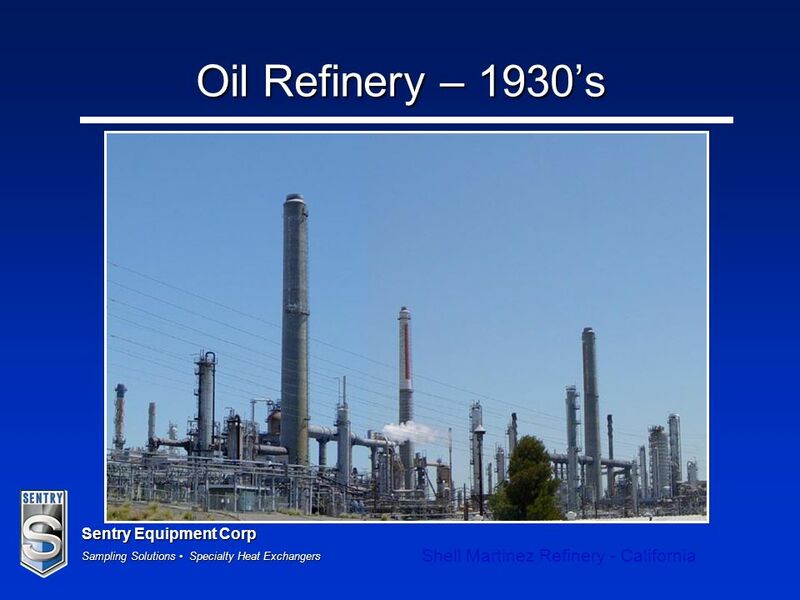 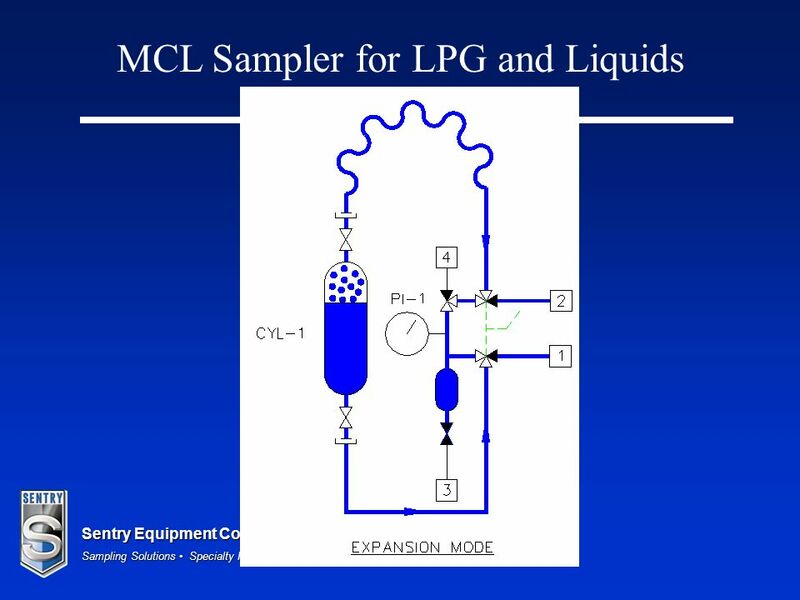 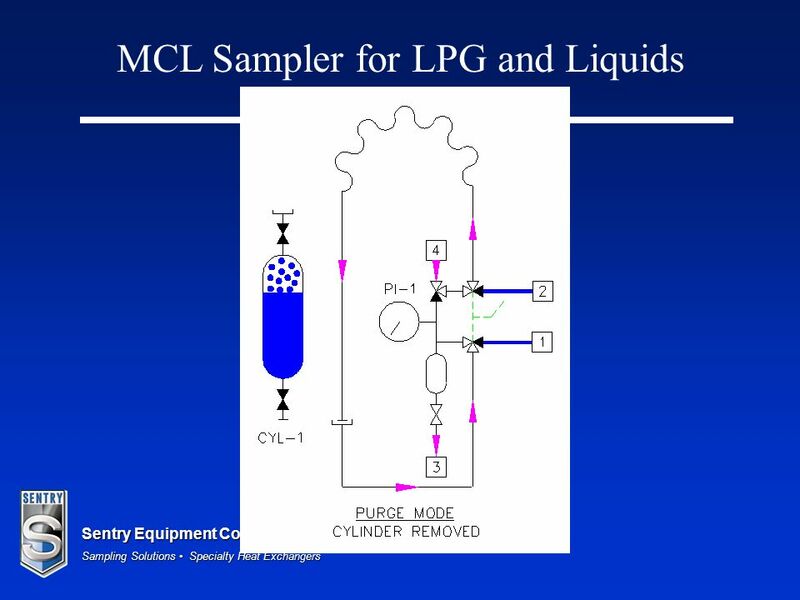 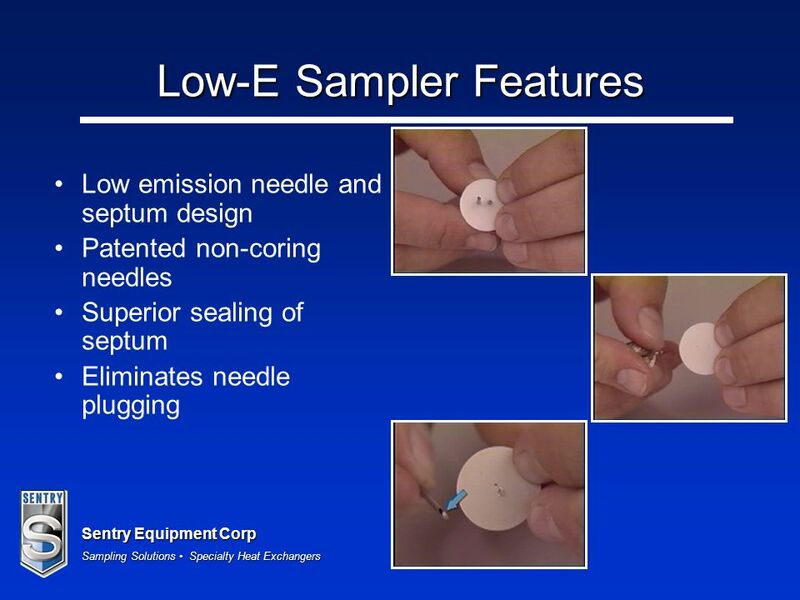 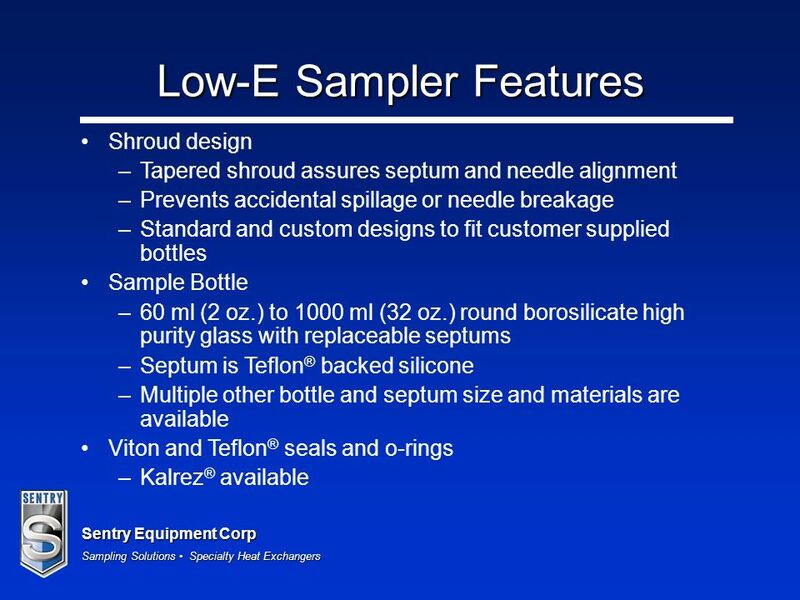 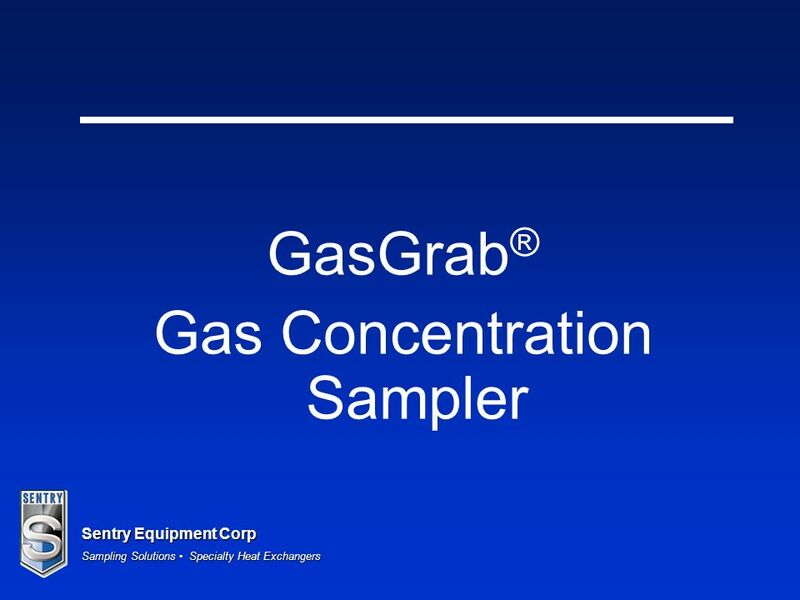 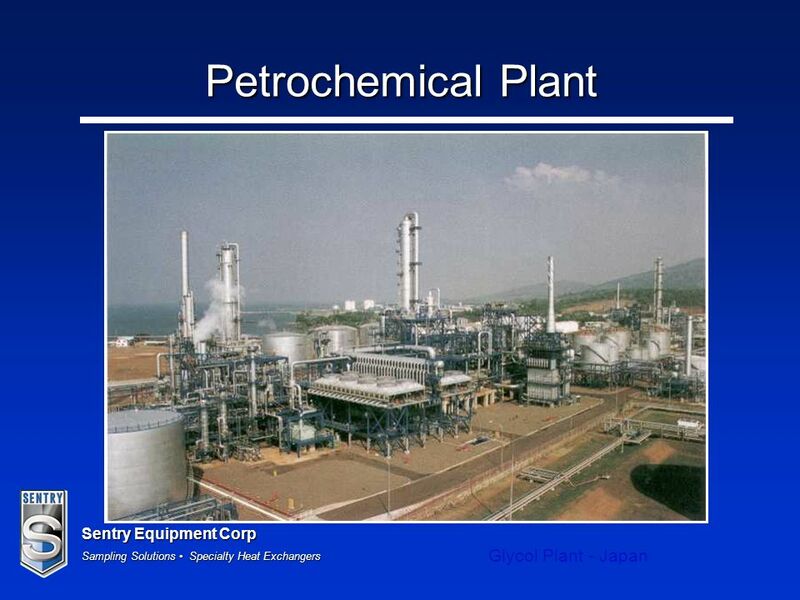 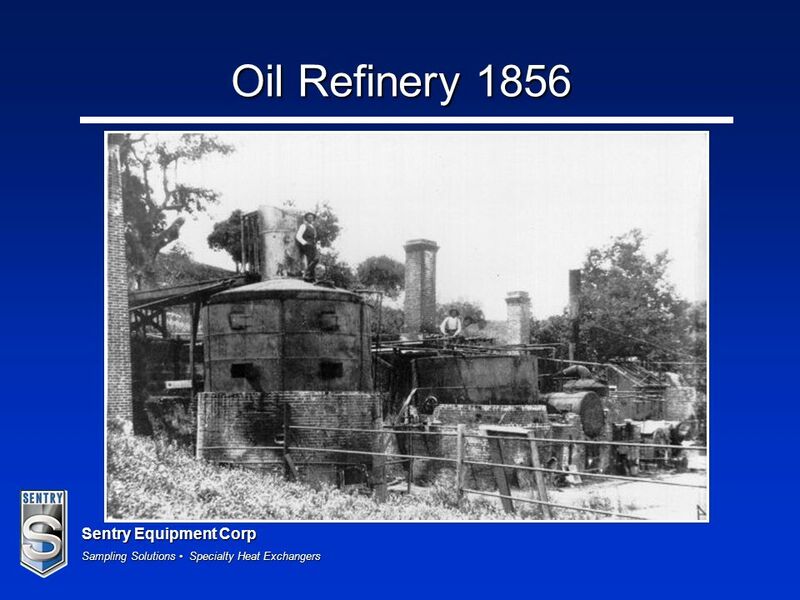 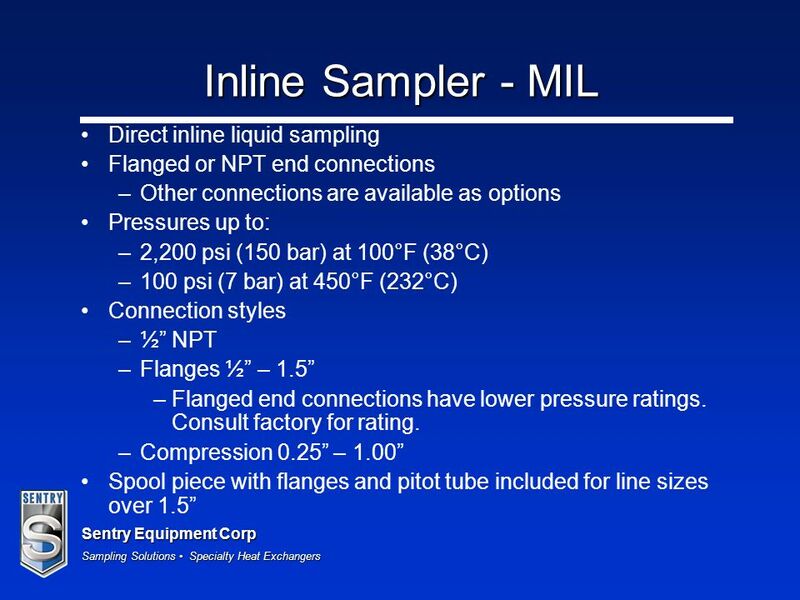 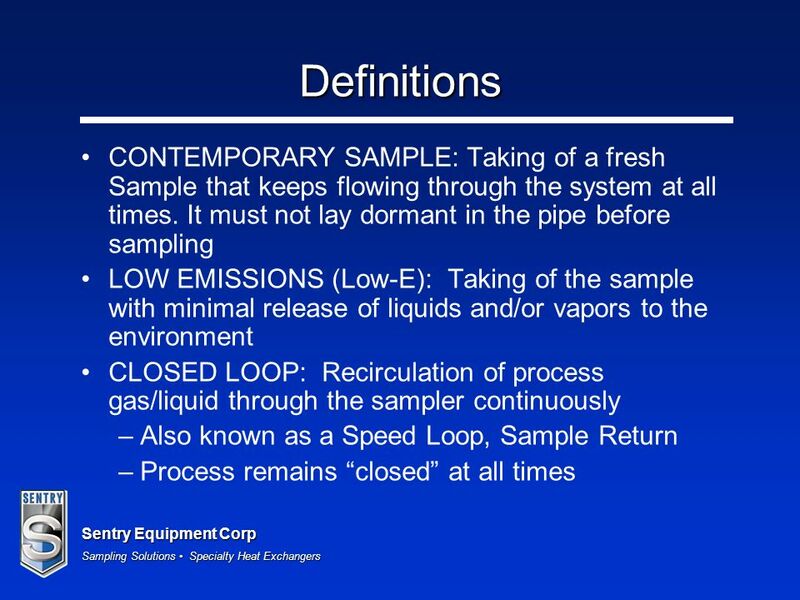 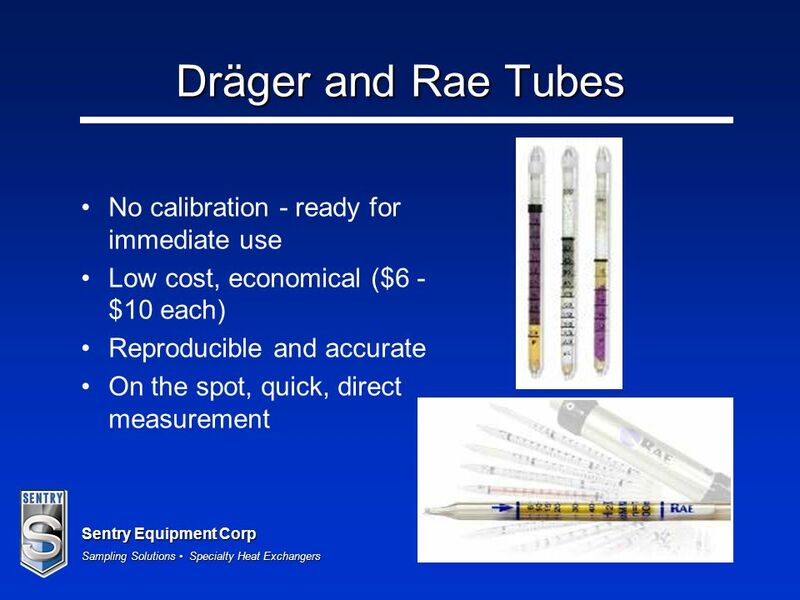 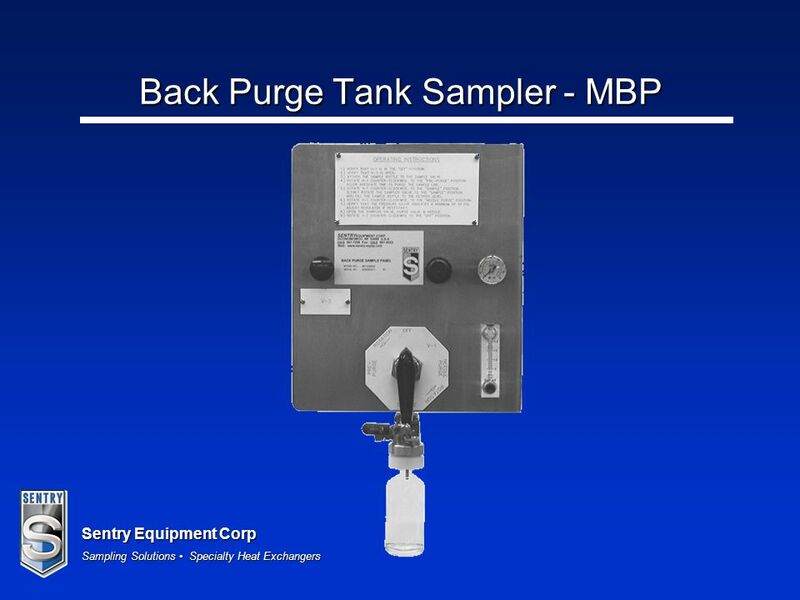 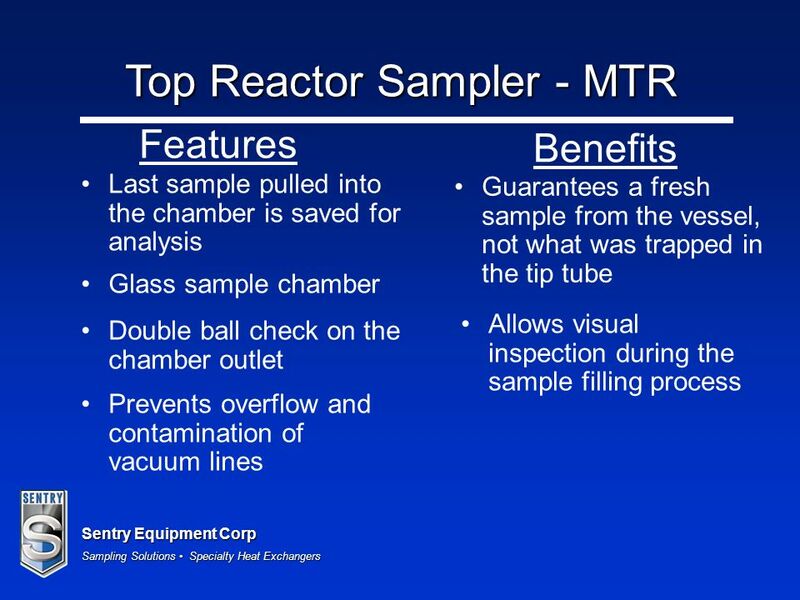 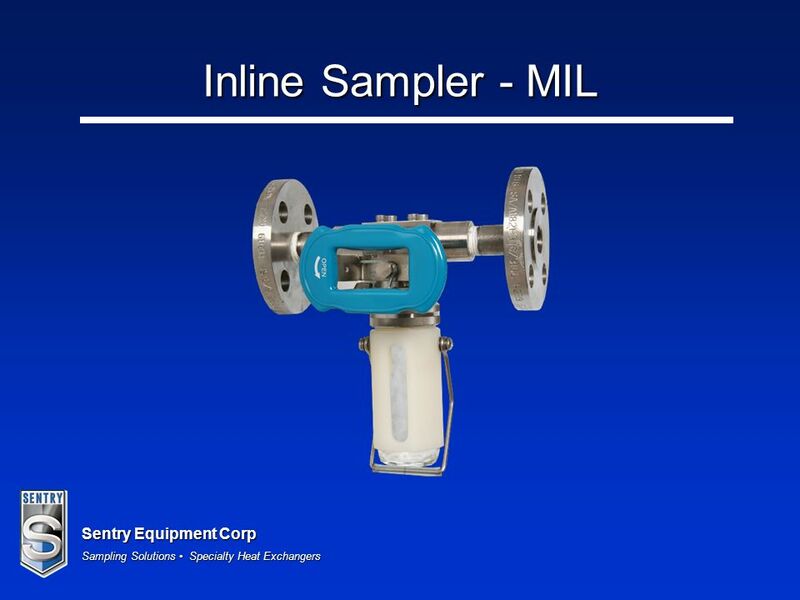 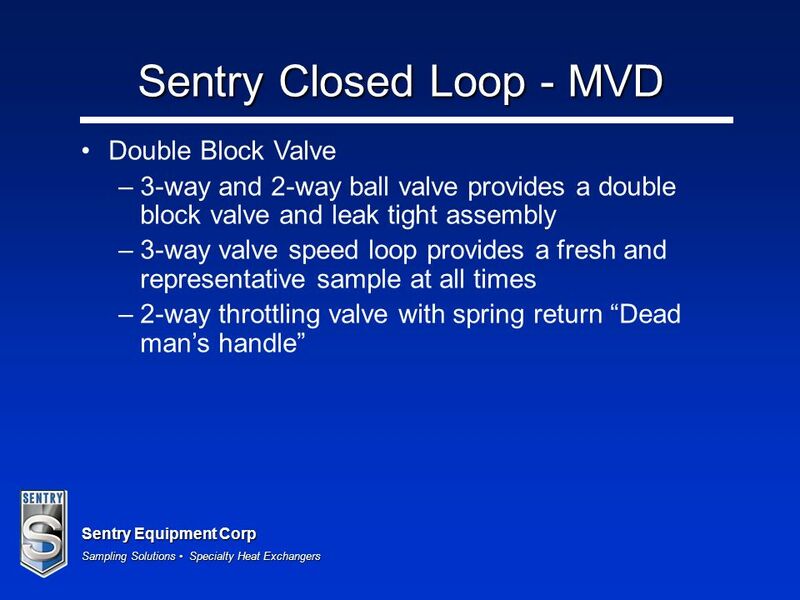 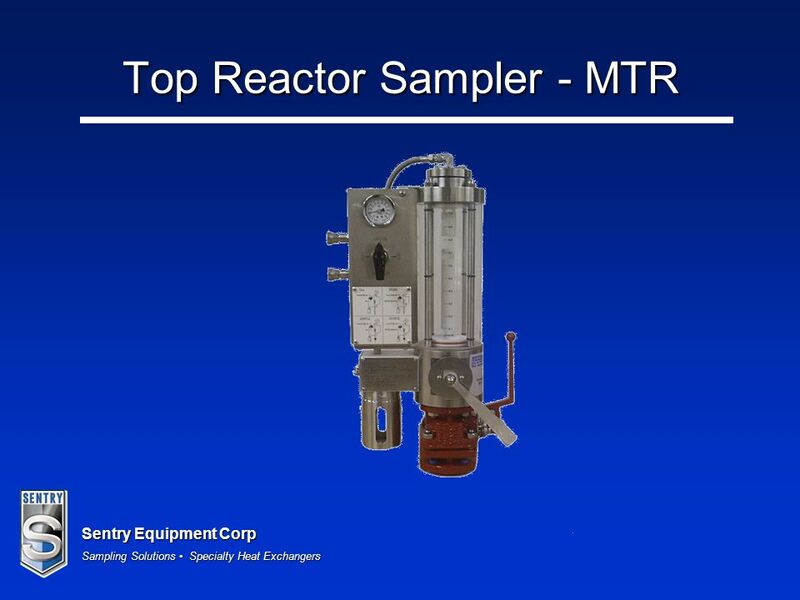 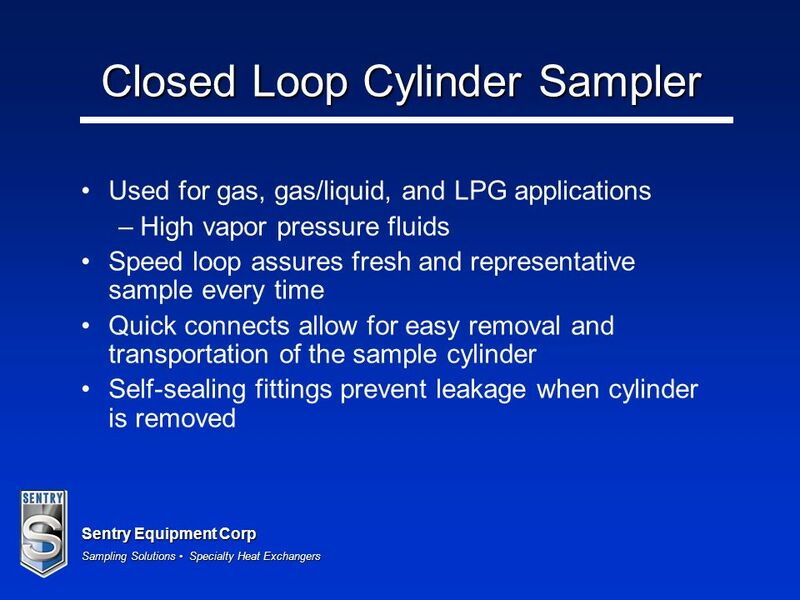 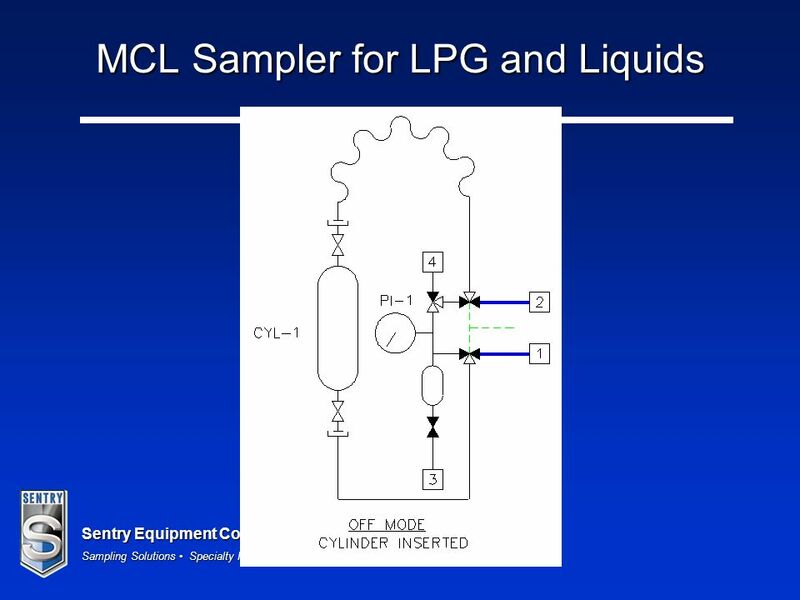 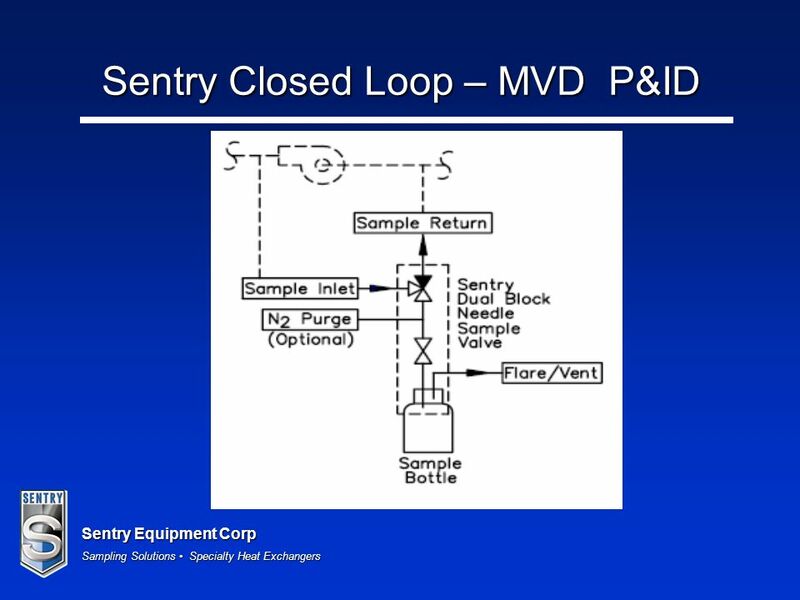 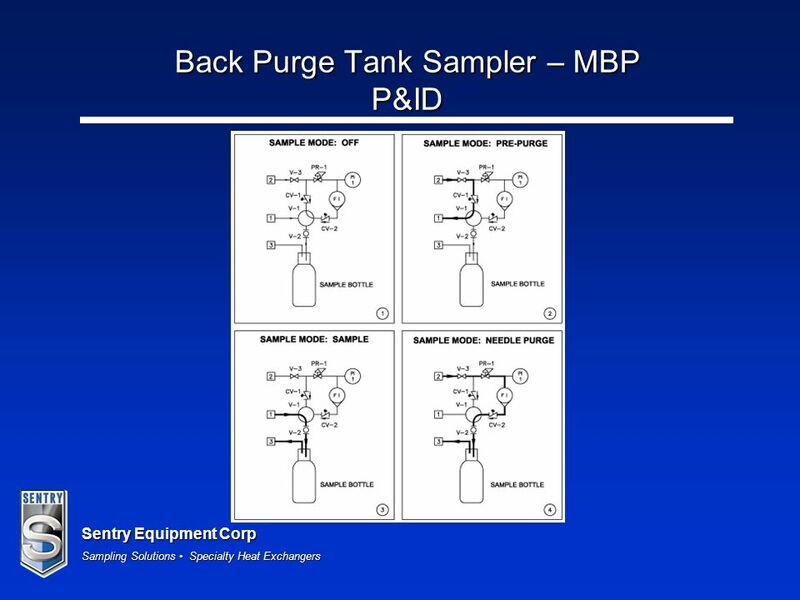 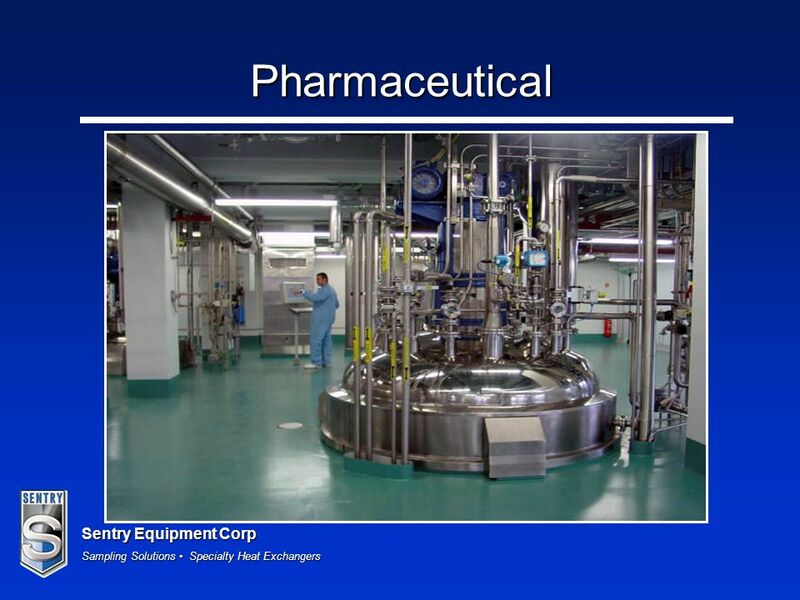 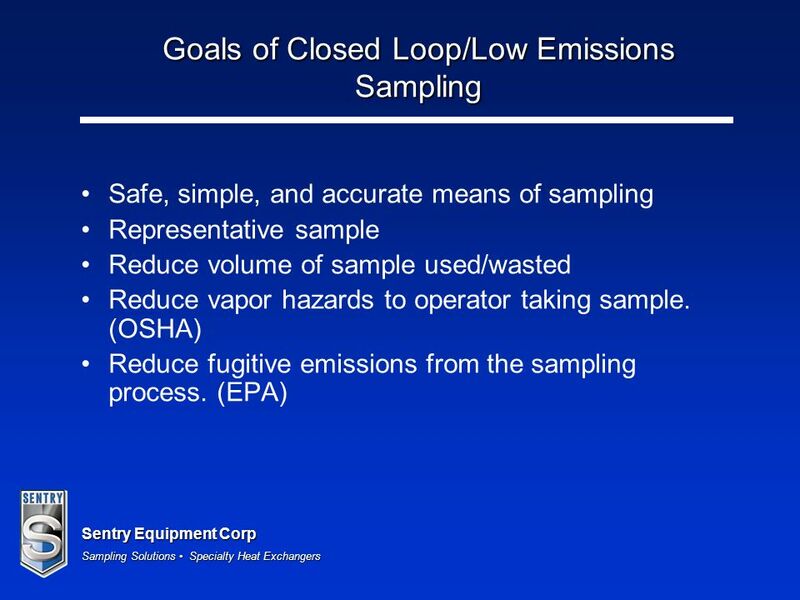 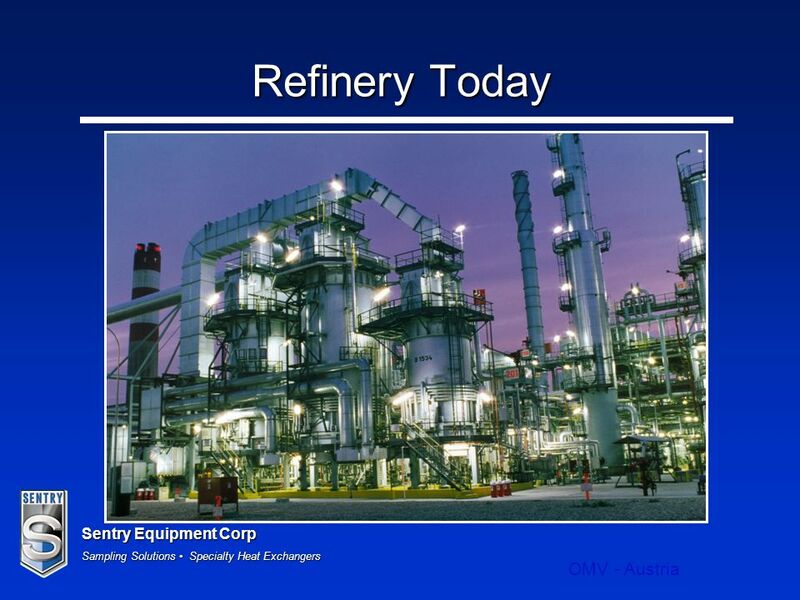 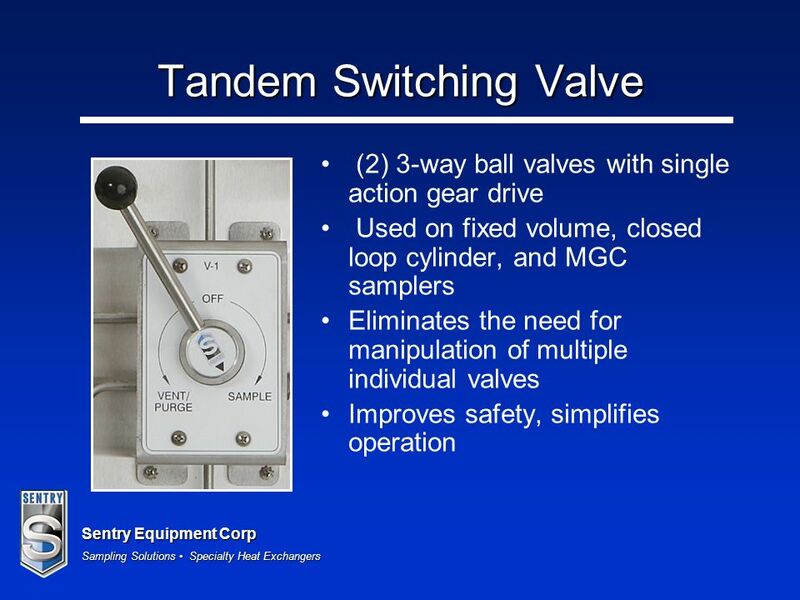 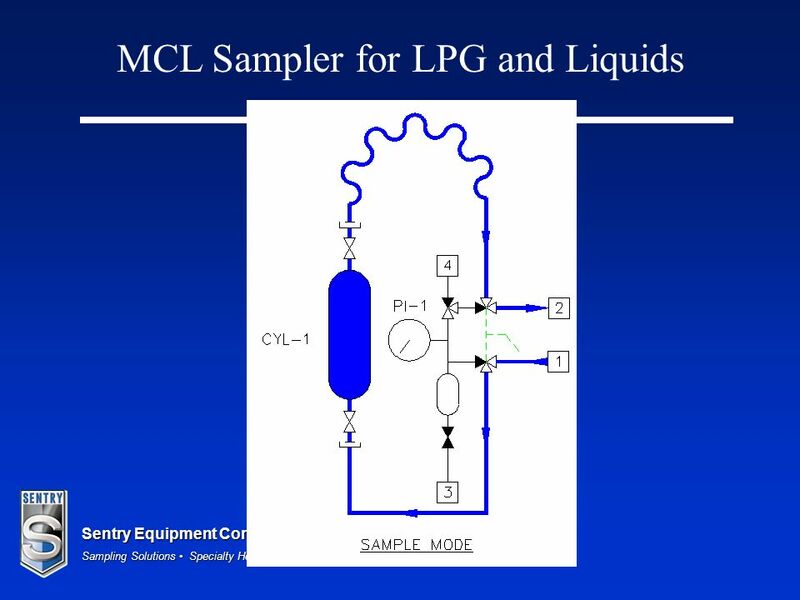 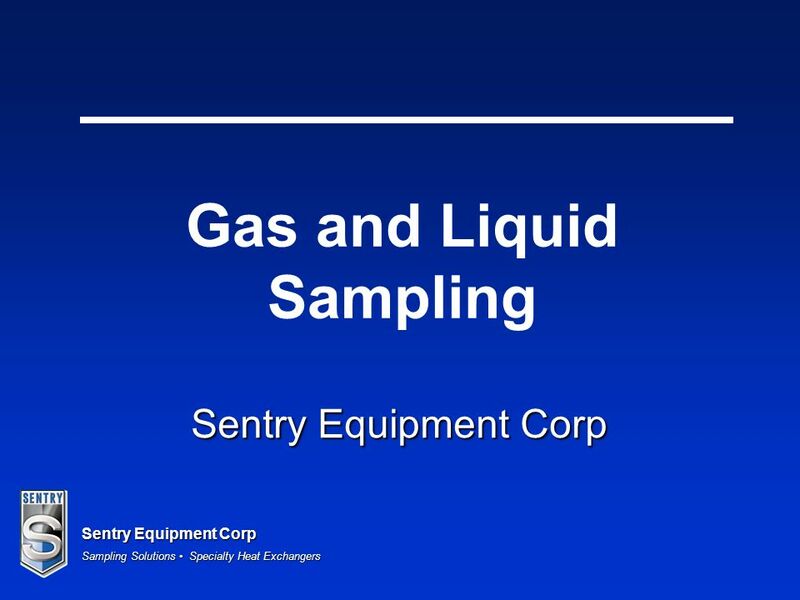 Download ppt "Sentry Equipment Corp Sampling Solutions Specialty Heat Exchangers Sentry Equipment Corp Gas and Liquid Sampling." 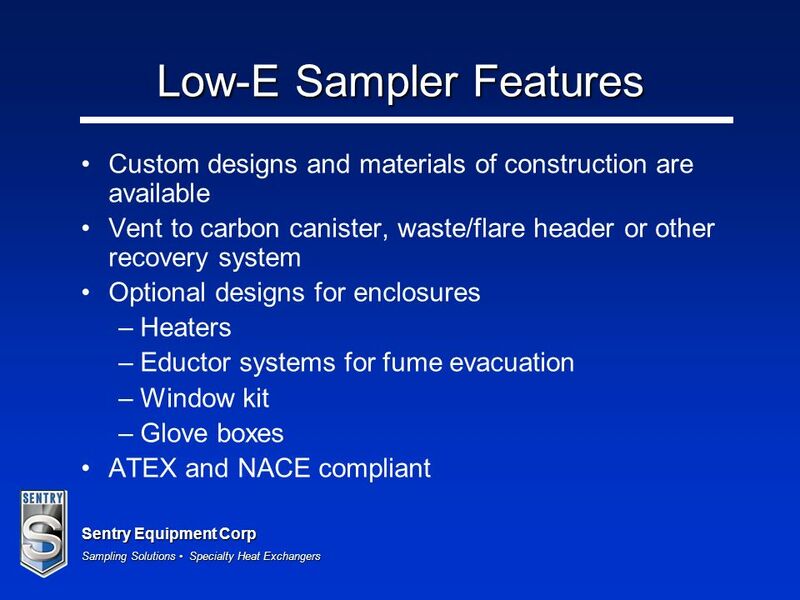 CATALITE ® CBA Series Complete Breathing Air Purification System Taking Your Workers From Hazard to Health 15 – 940 scfm. 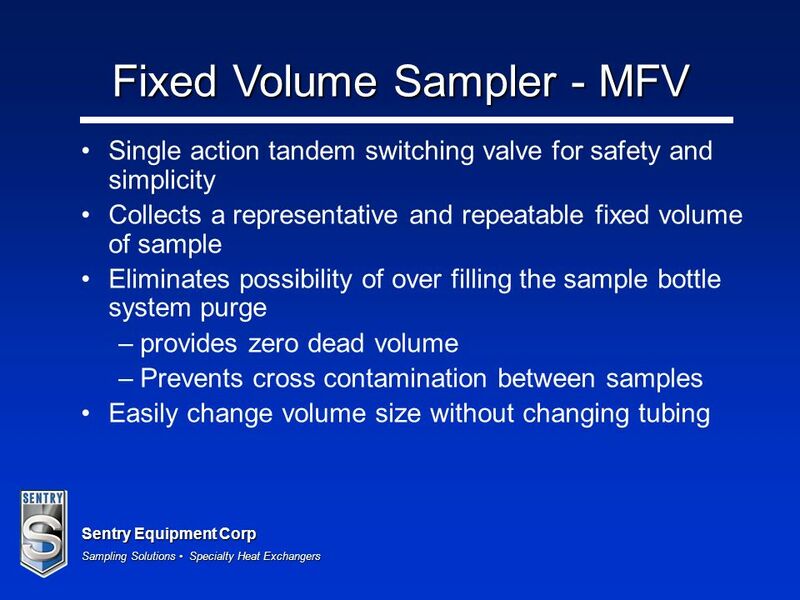 Purpose of a VPA Filling & Metering Pump… Imagine having an employee who constantly measures out a precise dose of liquid whenever it’s needed. 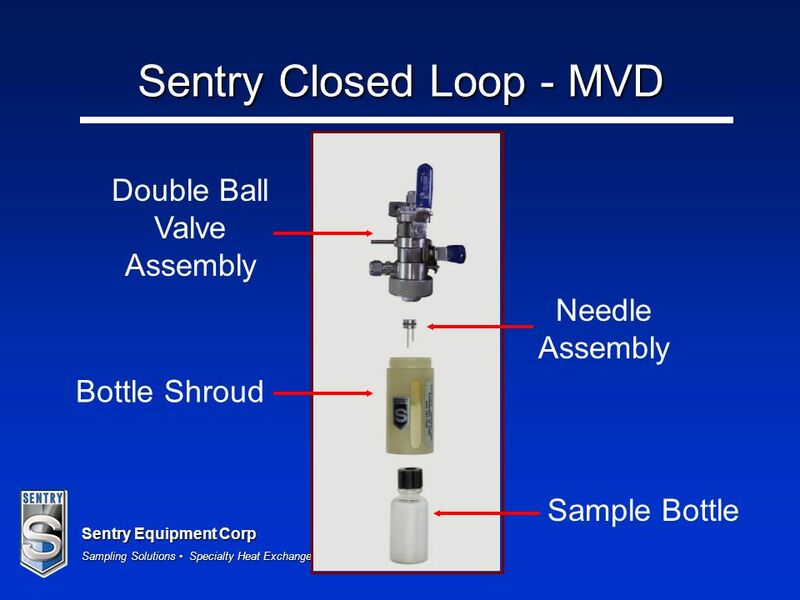 Air Release Valve Series ARV Product Education Course. 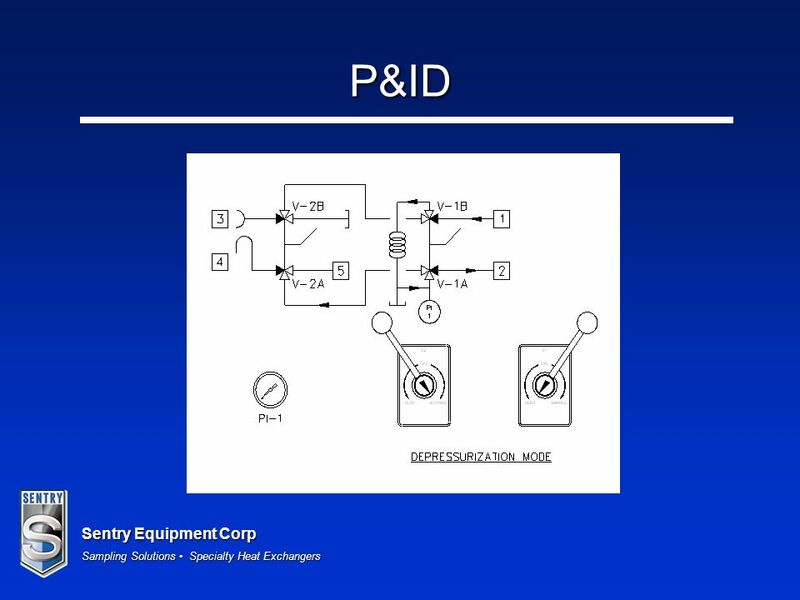 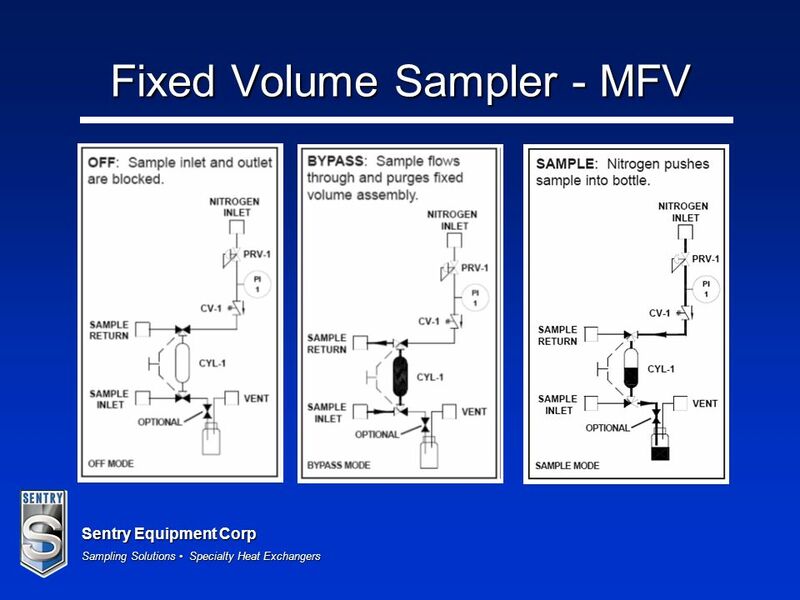 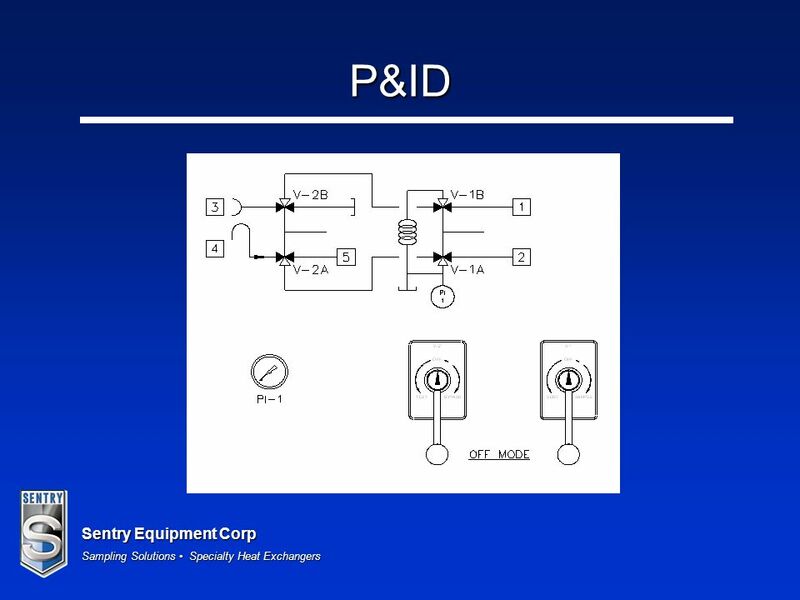 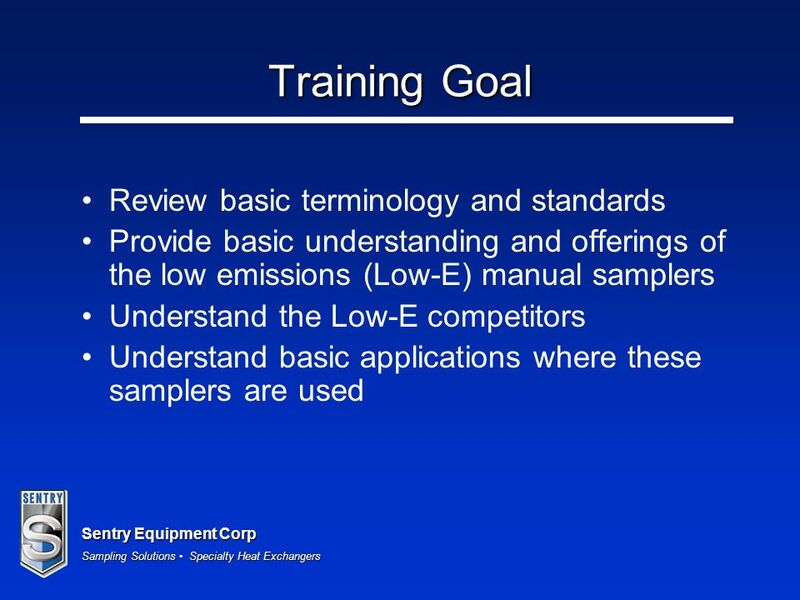 1 of Emission Control Theory Support Automotive – Engine Performance Topics covered in this presentation: Types of Emissions Emission Control Devices. 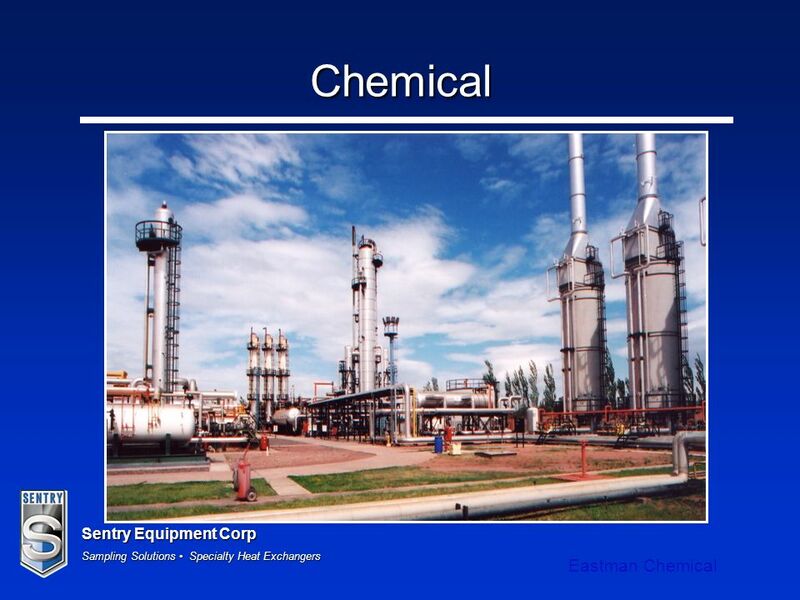 P R E S E N T.  We appreciate the opportunity to introduce you to our water based, (not petroleum or acid based), chemicals that dissolve the paraffin. 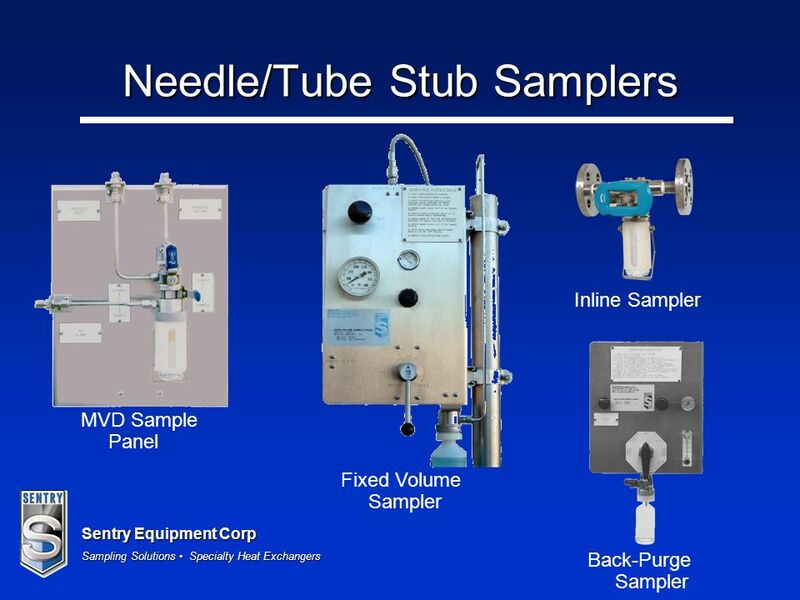 The Swagelok® SSV Series Stream Selector System for Process Analyzer Applications Swagelok introduced the next generation of stream selection technology. Cooling System Get the engine up to optimum operating Temperature as quickly as possible and maintains it at that temperature. 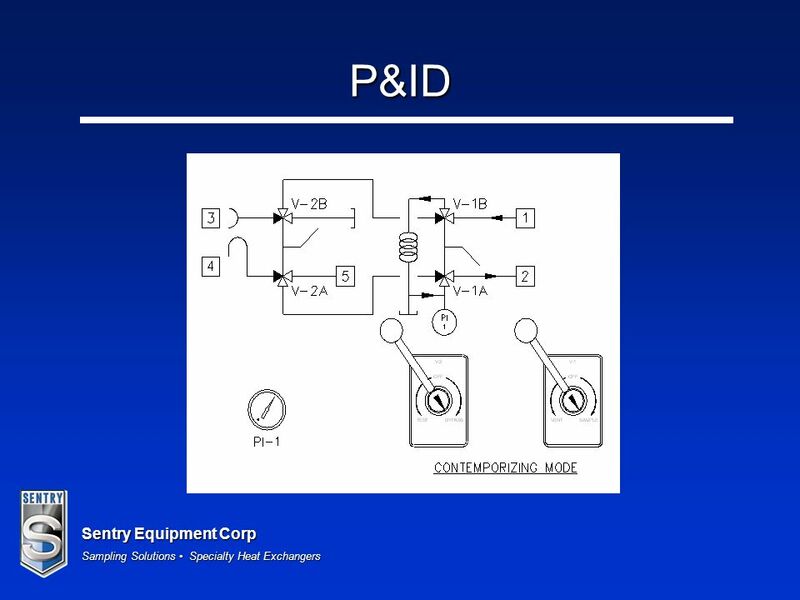 Controls the heat produced. 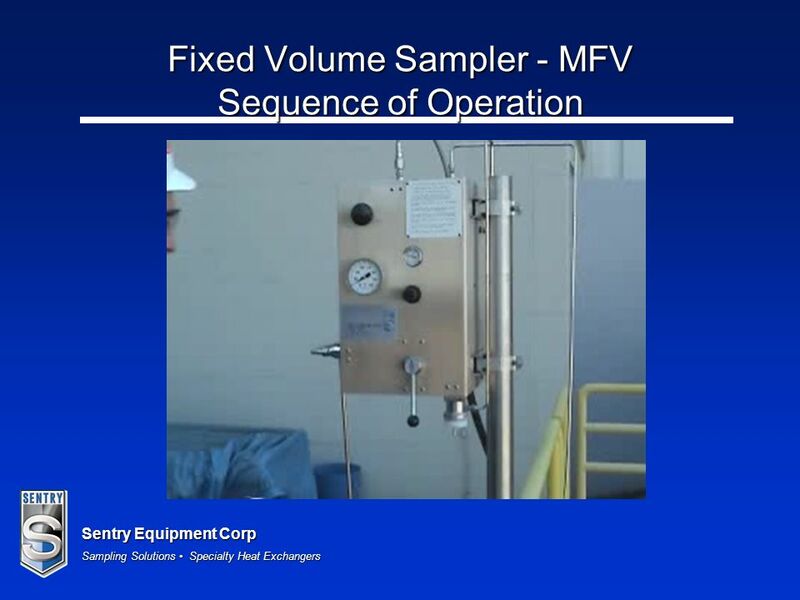 Cooling As working temperatures rise, the strength of metals used reduces. 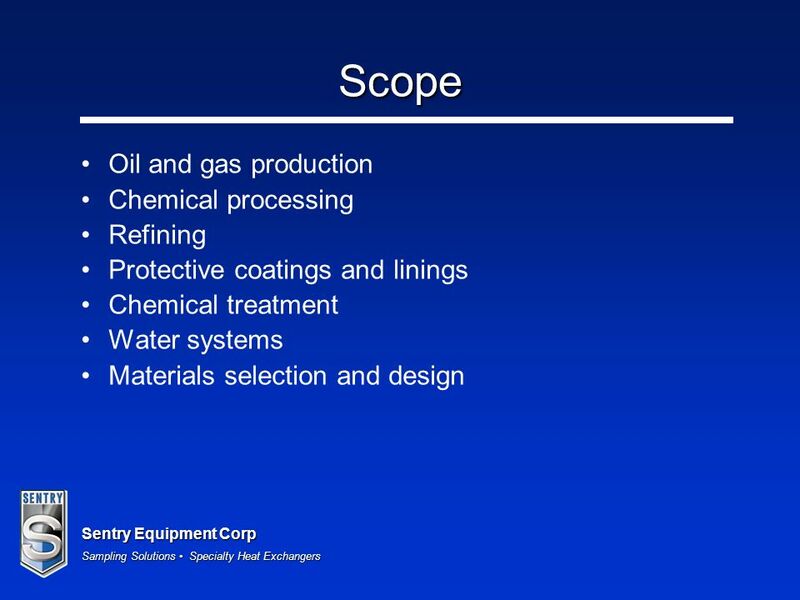 This in turn will force manufacturers to use superior metals/alloys, which can. 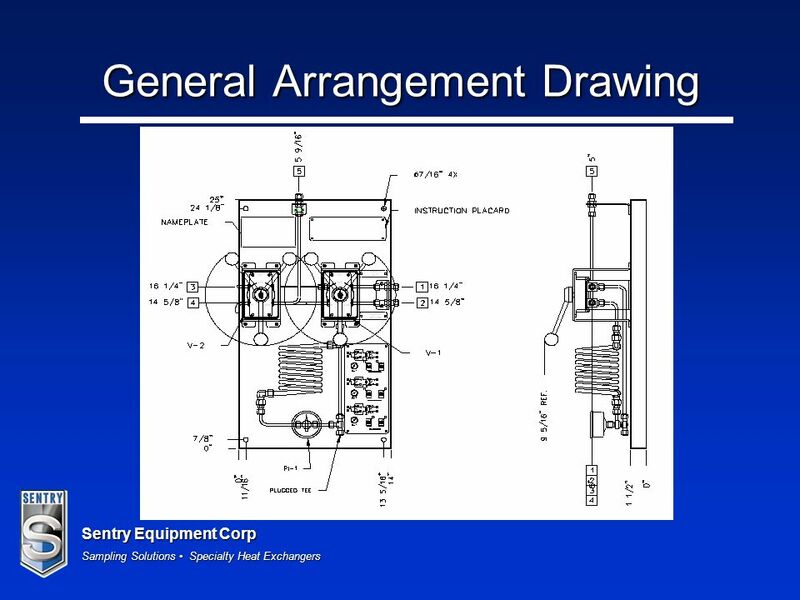 4-1 Chapter 4 Overview b The DCM is very complex Mechanical, electrical, hydraulic and safety systems all work together Mechanical, electrical, hydraulic.